Today’s introduction marks a “first” of a different sort- a first for Ertai’s Lament. Most any broad honorarium you could apply to Visions has likely already been claimed by Mirage, but this marks the first time we’ve looked at back-to-back sets. In the past we’ve done a set, then some months later perhaps returned to look at the next set’s offerings. This time, in the spirit of Project Mirage Block, we’re going right from one set to the next. This gives us a bit more focus on what makes one set’s precons different from the next, as we get to see Mirage block unfold before our eyes, one deck at a time. What themes can be supported by the growing card pool? What changes do we see from one set to the next? We look forward to exploring these concepts as we transition into Visions, and then round the bend into Weatherlight. Mirage is a fascinating block for a number of reasons, not least because it marks the origin of the very concept of “blocks.” Prior to Mirage, sets were not linked in so overt a fashion. Indeed, the only sets truly linked to one another prior to 1996 were Ice Age (June 1995) and Alliances (June 1996), a ‘block’ which would only later be completed with the release of Coldsnap a decade later. Every other set leading up to Mirage was self-contained- Mirage was the first to kick off the three-set cycle. Or was it? You might have noticed that the history of the Mirage set itself wasn’t covered in our reviews of the Mirage decks, and for good reason. For one thing, the origin of each of the four individual decks was so unique that it precluded a broader approach to the set. The other reason is that the story of Visions is the story of Mirage. And in many ways, it’s the story of Legends and Invasion as well. Like some sort of evolutionary tree, all three sets can be traced to a common ancestor: Alpha. In some sense, that can be said for most any Magic expansion, but in these three cases the link was far more direct than most. In 1991, Richard Garfield was developing the game that would soon come to be known as Magic: the Gathering. (Perhaps more accurately, he was developing the game Magic, of which the Gathering was only going to be the opening release. This plan, and the differing card-backs, never quite made it to full fruition.) While it would be another two years before the game saw commercial release, extensive playtesting of the game was well underway. In developing the game, Garfield had recruited a number of gamers he had met through his local bridge club (including Lily Wu, who would eventually become his wife). This core of playtesters not only would help refine Magic itself, but would go on to break into three different groups and design further expansions for the game. These expansions- as yet unreleased- were called Ice Age, Spectral Chaos, and Menagerie. Ice Age, unsurprisingly, went on to be released as Ice Age. As discussed in our review of Naya Domain, Spectral Chaos was the “colour matters” set designed by Barry Reich, which went on to be the springboard for Invasion. As you might have guessed by now, that left Menagerie, the set that would go on to form the basis for Mirage and Visions.And while there’s more of the tale to tell, we’ll be pausing it here to begin looking at our first deck of the set, the White Weenie deck Legion of Glory. If there was one standout facet of Mirage’s environment, it was pace. Generally speaking, the decks were on the slower side, filled with three- and four-drops. Without recourse to a great deal of ramping, the decks instead were given the luxury of playing more expensive creatures by dint of the fact that there just wasn’t a lot of speed open to any one of them. There was little danger of getting swarmed and overwhelmed early on, so decks could unfold at a steady pace and compete evenly on the battlefield. The average converted mana cost per deck ranged between 2.72 (Ride Like the Wind) and 2.94 (Burning Sky), a fairly narrow spectrum. In large part, this was due to the relative paucity of cheaper creatures. A Gatherer search reveals that while there were twelve one-drop creatures in Mirage, many of them were unplayable in Theme Decks for one reason or another. The Phyrexian Dreadnought, for instance is a rare card, and needs to be built around to be effective. 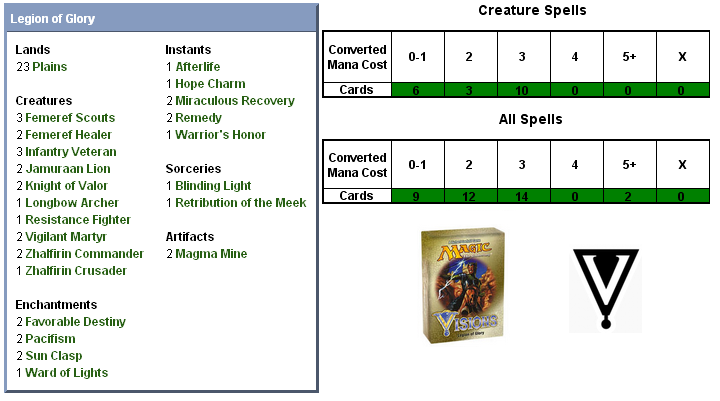 The Guildmage cycle required a three-colour deck for optimal use, and the only deck with three colours in it was Jungle Jam, where Red was splashed to power out a single card (Sawback Manticore). With the widening of the card pool with Visions, we can begin to reexamine those deck archetypes that perhaps were unsustainable in a Mirage-only environment- and White Weenie certainly ranks amonsgt them. The early game is clearly central to Legion of Glory in a way that wasn’t feasible in Mirage, boasting an average converted mana cost of only 2.30. The first card we find here is a familiar face in the Vigilant Martyr. This was a fine inclusion for Ride Like the Wind, for though it boasted few enchantment cards it certainly had no shortage of creatures. Legion of Glory boasts a full seven enchantments, making the Martyr’s second ability quite relevant indeed. Next we find a trio of Infantry Veterans, a Visions card which has seen a number of reprints throughout Magic’s history (even as recently as Magic 2011 and Duel Decks: Elspeth vs Tezzeret). Like the Martyr, this is a one-drop that isn’t entirely irrelevant when drawn later in the game, when 1/1 creatures can’t be expected to have much of an impact in the red zone. By being able to deliver a power/toughness boost at instant speed, the Veteran is an on-board combat trick that can help make blocking assignments more complicated for your opponent. As we’ll see, having on-board tricks to help sway combat in your favour is one of the deck’s primary themes. Finally, there’s a Resistance Fighter, another Visions addition. Here too is a card that can make your opponent scratch their head when deciding how combat is going to play out, since it can be popped to deliver a very narrow, one-sided Fog effect. Moving up to the two-drops, we find only a trio of creatures here. The Longbow Archer is a very sturdy value, being a two-mana 2/2 that has both first strike and reach. 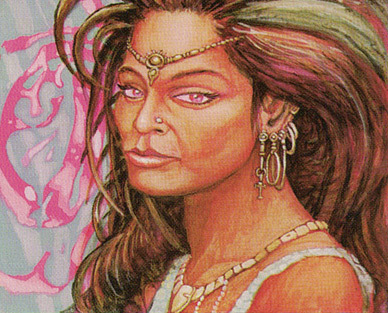 Then you have a pair of Femeref Healers, the Jamuraan version of the Samite Healer. Perhaps not a first-round draft pick for an aggressive combat deck, the Healer nevertheless does her part to make sure that combat is a difficult proposition for your opponent by making trades become profitable. The largest contingent of creatures weigh in at your three-drop slot. Unlike the three-drop-heavy Ride Like the Wind, this is the end of the line for your creatures- they will get no more expensive than this. That fact alone gives you some advantage by an increased resilience to mana screw. As expected, there are some familiar faces here as well. Mirage gifts us with a pair of flank-Knights in the Zhalfirin Commanders, and throws in a trio of Femeref Scouts to make sure you’ve adequately prepared your defenses. And while not every creature in the deck can take advantage of the Commanders’ pumping, more than a few of them can. Indeed, Visions offers some more versions of the mighty flank-Knight, beginning with the Knight of Valor. Two to the deck, these essentially give themselves double-flanking as an activated ability. The first of the deck’s two rares, Zhalfirin Crusader, also appears here. With the ability to redirect any damage he takes to another creature or player, the Crusader can become almost impossible to kill in straight combat so long as you have the mana to keep up. In the meantime, he can decimate your opponent’s side of the table by handing out damage left and right. In the end, your opponent might often choose to skip the headache and just let him through, which is not such a bad outcome after all. Finally, we find a pair of Jamuraan Lions. Offensively-lopsided bodies, they will often be at their most helpful my taking your opponent’s best blockers out of the equation. Overall, Legion of Glory gives you a flood of Weenie creatures that are efficiently priced and give you tremendous influence on the battlefield- exactly what this deck loves most. For a simple combat deck, Legion of Glory packs in a surprisingly impressive amount of removal, something we didn’t see a lot of in the last set. A pair of Pacifisms are to be expected, and the pinpoint removal spell Afterlife makes an appearance here as well. Beyond that, though, you have recourse to even more options! A pair of Magma Mines give you a place to sink your mana in the mid-to-late game that can help further the deck’s ambitions, while the deck’s other rare- Retribution of the Meek– is a bona fide board sweeper, even if its efficacy is restricted to the largest of your opponent’s creatures. Another mainstay of White Weenie is combat trickery, and Legion of Glory impresses here as well. Remedy’s damage prevention can help turn a clash of creatures into a very lopsided affair, while Warrior’s Honor gives your entire side a nifty boost- perfect for a game-ending alpha strike. Hope Charm can give one of your creatures a surprise first strike ability, as well as give you a small dose of lifegain (yawn) or destroy an aura. Finally, you have a pair of Miraculous Recoveries. Although expensive (the card itself is more expensive than any of the creatures it might be pulling back from the grave), the fact that it gives them a +1/+1 counter and is an instant more than justifies the added expense. And speaking of game-endling alpha strikes, the single copy of Blinding Light is just the enabler you’re looking for to take your opponent out of the game, regardless of how tight they’ve managed to make their perimeter security. The final third of the noncreature support spells are your beneficial creature auras. Ward of Lights can not only give one of your creatures protection from a particular colour, but it can do so at instant speed when needed- if you don’t mind losing the effect at the end of the turn. A pair of Favorable Destinies are essentially a with an added bonus, giving a conditional shroud for one additional mana. Lastly, the Sun Clasp– another Visions card- gives an even stronger bonus (+1/+3), and can enable the instant return of whatever creature it is enchanting. Canny players will recongise that this can be played on an opponent’s creature as ersatz removal, allowing you to effectively Unsummon it. Overall the improvements from the Mirage decks are not difficult to see, but we’ll be reserving judgment until we see how the decks hold up in battle. Join us in two days’ time when we take Legion of Glory into the arena to see how it holds up. Another wonderfully enlightening lesson on the history of the game. Oh, and the deck review was cool too 😉 Keep up the great work! Thanks! THis set’s been a fun one to write about- so much history! My favorite set in my favorite block. Why? Because this was around the time I started playing (and collecting) Magic. I absolutely wanted to get Visions complete and I still remember the final card being Relentless Assault. I loved Relentless Assault. A snap-include for my main deck the moment I opened it. is it just me or does Zhalfirin Crusader look an awful lot like Lando Calrissian?